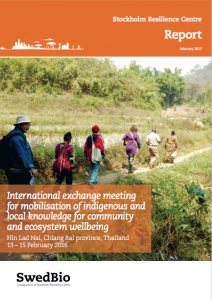 A report outlines the events and outcomes of a walking workshop in Hin Lad Nai, northern Thailand. There, the Karen community hosted representatives from the Philippines, Kenya, Ethiopia and Panama and discussed methods and outcomes of their community research initiatives. The communities piloting the Multiple Evidence Base (MEB) approach were welcomed by the elders and leaders of Hin Lad Nai. Each of them brought in experiences from their own community research. The “walking workshop” method consisted of sharing knowledge and insights while walking through the rotational farming landscape of the Hin Lad Nai. Participants, both local and visiting, had discussions outside, in cultivated fields, fallows, sacred sites, and water sources composing the landscape. In order to explore problems, reflect on experiences and elicit different perspectives, the host community guided the group, facilitating dialogue and seeking explanations, answers and possible solutions together. The exchange dealt with some specific areas of expertise, for instance rotational farming, marketing, revitalisation of seed systems, and eco-cultural calendars. Based on this, a discussion on validation methods in different knowledge systems was held. Importantly, Indigenous and local knowledge systems have their own ways of securing empirical and social legitimacy, and hence validate their knowledge. The MEB approach emphasises the value of letting each knowledge system be validated within its own context, rather than across knowledge systems. Allowing such validation to occur, helps to bridge across knowledge systems with equity and reciprocity. Weaving together knowledge systems ensures that the expertise of each knowledge holder observing and managing biodiversity on the ground is taken into account. This contributes to creating a space for better policy decisions, related to biodiversity and ecosystem governance. Participants, in fact, reflected on how to best use the outcomes of their community research, and share the progress made. Ultimately, the richness of this knowledge could contribute to better laws and better conservation, from local decision making, to national biodiversity monitoring, to international processes such as the Convention on Biological Diversity Aichi Biodiversity Targets. Finally, a video presents the community of Hin Lad Nai and its commitment to engage in trans-generational learning with young people, showing how healthy, delicious food can be produced directly from the diversity of the traditional rotational farming system. Tebtebba Foundation, Philippines; Pgakenyaw Association for Sustainable Development (PASD), Thailand; African Biodiversity Network (ABN) with Institute for Cultural Ecology (ICE), Kenya; and MELCA, Ethiopia; Forest Peoples Programme (FPP) with Fundación para la Promoción de Conocimiento Indígena (FPCI), Panama. Leaders and elders from Thai indigenous communities and organizations also participated, along with the elders and the pilot research team in the host community of Hin Lad Nai.